A DNA microarray (commonly known as gene chip, DNA chip, or biochip) It is a collection of microscopic DNA spots attached to a solid surface. 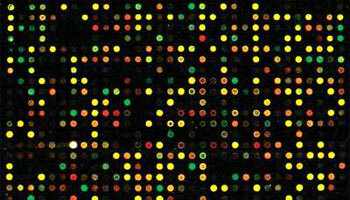 DNA microarray that reveals expression levels of 2,400 human genes. 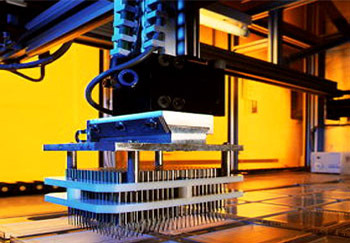 DNA microarray analysis is one of the fastest–growing new technologies in the field of genetic research. Today, the most sorted out and developing technologies are Information technology and Recombinant DNA technology. The use and applications of recombinant DNA technology has become a commonplace as new products from genetically modified plants, animals, and microbes have become available for human use. In the year 1997, Dolly made headlines as the first successfully cloned large mammal (sheep). Since then, there have been many similar advances in medicine, such as targeted cancer therapy; many advances in agriculture, such as transgenic insect-resistant crops, vitamin rich golden rice; and many advances in animal husbandry, such as growth hormones and transgenic animals (an animal that has received recombinant DNA). Most biotechnologists envision DNA technological applications as one of the new frontiers in science with tremendous growth and discovery potential. DNA technology is the chemical manipulation of the genotypes and resulting phenotypes of organisms such that living organisms are modified. (Genotype is the genetic make–up of an organism and phenotype is the physical appearance of an organism). The use of DNA technology has revolutionized how scientists study genetics, biochemistry, even ecology and evolutionary biology of organisms, plus has allowed the development of novel biological products, indeed whole industries are now devoted to DNA–technology based production and analysis of biological materials. Scientist examining DNA sequencing autoradiogram on a light box Each group of four strips represents the nucleotide sequence of AGCT (Adenine – Guanine – Cytosine – Thymine) in the DNA of the nematode worm, Onchocerca volvulus, a human parasite responsible for cutaneous onchocerciasis and river blindness in tropical countries. One of the great achievements of modern science has been the sequencing of the human genome, which was largely completed by 2003. The sequencing of the first complete genome, that of a bacterium, had been achieved in previous years. During the intervening years, researchers accelerated the pace of DNA sequencing, while working on other genomes, aided by the development of faster and faster sequencing machines. These sequencing accomplishments have all depended on advances in DNA technology, starting with the invention of methods for making recombinant DNA. This is DNA in which nucleotide sequences from different sources – often different species – are combined in vitro into the same DNA molecule. The methods for making recombinant DNA are central to genetic engineering, the direct manipulation of genes for practical purposes. Applications of genetic engineering include the manufacture of hundreds of protein products, such as hormones and blood–clotting factors. Using DNA technology, scientists can make recombinant DNA and then introduce it into cultured cells that replicate the DNA and express its genes, yielding a desired protein. DNA technology has launched a revolution in the area of biotechnology, the manipulation of organisms or their components to make useful products. Practices that go back centuries are forms of biotechnology: for example, the use of microbes to make wine and cheese and the selective breeding of livestock, which exploits naturally occurring mutations and genetic recombination. 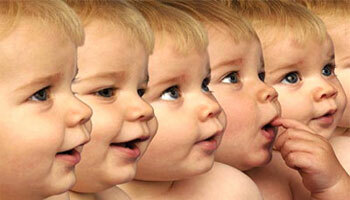 Human cloning: Conceptual image of a row of heads of identical cloned babies Human clones are genetically–identical duplicates that are created by transplanting the genetic material from a template person into an egg (female reproductive cell) which has had its genetic material removed. Triggering the growth and development of the egg will ultimately produce a baby that is a clone of the original individual. Modern biotechnology based on the manipulation of DNA in vitro differs from earlier practices by enabling scientists to modify specific genes and move them between organisms as distinct as bacteria, plants, and animals. 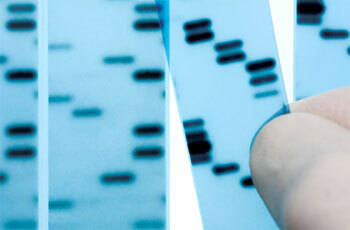 Thus, DNA technology is now applied in areas ranging from agriculture to criminal law. Its use allows researchers in virtually all fields of biology. identifying and isolating specific DNA fragments. These approaches have made it possible for scientists to engineer specific DNA sequences, and even novel combinations of DNA sequences in a test tube, which can then be introduced back into cells. 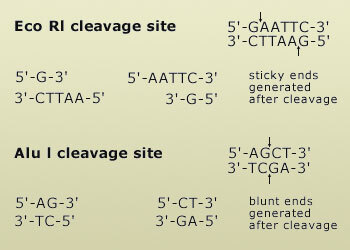 Restriction endonucleases cleave DNA at specific sites Shown are the recognition sites for two restriction endonucleases: Eco RI and Alu I. The arrows indicate where the phosphodiester bonds will be broken. Both recognition sites are palindromes. Eco R1 has a 6 bp recognition site, and leaves sticky ends with 4 – nucleotide overhangs. Alu I has a 4 bp recognition site, and leaves blunt ends. One of the first steps to manipulate and study discrete DNA sequences is the ability to cleave large molecules of DNA into smaller defined fragments. This can be accomplished by the use of restriction endonucleases, which are enzymes that can cleave (or digest) double–stranded DNA in a site–specific fashion. These enzymes are found naturally in a variety of different bacteria, and are used by the bacteria to degrade foreign DNA; their own DNA is modified to be protected from degradation. Generally, restriction endonucleases recognize a short nucleotide sequence (4 – 8 bp) and cleave the DNA in a precise fashion. Cleavage breaks the phosphodiester bond in both the strands of double–stranded DNA. Many restriction endonuclease recognition sites are palindromic, meaning the sequence is identical whether reading from the top or bottom strand (but always reading 5' to 3'). For example , the restriction endonuclease Eco RI, which cleaves the sequence 5'GAATTC3', was initially isolated from bacteria (Escherichia coli). This restriction endonuclease will cleave DNA isolated from any cell, prokaryotic or eukaryotic. There are dozens of different restriction endonucleases that recognize and cleave different sequences. Examples of two restriction endonucleases and their recognition sites are illustrated in the figure. Using a restriction enzyme and DNA ligase to make recombinant DNA. Recombinant DNA (rDNA) is a form of artificial DNA that is created by combining two or more sequences that would not normally occur together. The restriction enzyme in this example (called EcoRI) recognizes a specific sequence, (restriction site) and makes staggered cuts in the sugar–phosphate backbones, producing fragments with sticky ends. Any fragments with complementary sticky ends can base–pair; if they come from different DNA molecules, recombinant DNA is the product. Some enzymes (e.g. Eco R1) cleave DNA in such a fashion as to leave short, single–stranded overhangs (sticky ends); others (e.g. Alu I) leave blunt ends (illustrated in Figure ). If DNA, from any source (e.g. bacteria, plants or animals), is cleaved with a single restriction enzyme, the generated DNA fragments will have identical sequences at their ends. The frequency of cleavage of DNA is simply the frequency of a particular site occurring in the DNA. For an enzyme that has a 6 bp recognition site, the probability that the four nucleotides (G, A, T, C) will make up the recognition sequence is 1 in 4096 bp (1 in 46). Restriction enzymes are DNA–cutting enzymes found in bacteria (and harvested from them for use). Because they cut within the molecule, they are often called restriction endonucleases. In order to be able to sequence DNA, it is first necessary to cut it into smaller fragments. Many DNA–digesting enzymes (like those in your pancreatic fluid) can do this, but most of them are no use for sequence work because they cut each molecule randomly. This produces a heterogeneous collection of fragments of varying sizes. What is needed is a way to cleave the DNA molecule at a few precisely-located sites so that a small set of homogeneous fragments are produced. The tools for this are the restriction endonucleases. The rarer the site it recognizes, the smaller the number of pieces produced by a given restriction endonuclease. Gel electrophoresis Electrophoresis is a technique used to separate and sometimes purify macromolecules - especially proteins and nucleic acids - that differ in size, charge or conformation. As such, it is one of the most widely-used techniques in biochemistry and molecular biology. As we've understood the concept how the lengthy DNA molecule is fragmented, the next step is to separate the DNA fragments. Here comes the technique named gel electrophoresis. This technique uses a gel as a molecular sieve to separate nucleic acids or proteins on the basis of size, electrical charge, and other physical properties. Because nucleic acid molecules carry negative charges on their phosphate groups, they all travel toward the positive electrode in an electric field. Thus, gel electrophoresis separates a mixture of linear DNA molecules into bands, each consisting of DNA molecules of the same length. The figure here shows the process of how DNA fragments of differing lengths can be separated by agarose gel electrophoresis. A mixture of DNA fragments is loaded onto a gel, the gel is covered in buffer, and an electric field is generated when the gel box is connected to a power supply (negative electrode on top of the gel, and positive on the bottom). The DNA migrates through the gel toward the positive electrode. Larger DNA molecules migrate more slowly, and smaller fragments migrate more quickly. Typically a molecular weight marker (MW marker) is included, which is essentially a mixture of DNA fragments of known lengths. The migration of an unknown fragment is compared to the migration of the MW marker and thereby the length of an unknown fragment is determined. The distance of migration is proportional to the length of the DNA fragment. Also, in order to visualize the DNA, the gel must be either cast with, or soaked in, a fluorescent dye. The most common dye used is ethidium bromide, which binds to DNA and fluoresces under UV light. Nucleic acid hybridization (A) If the DNA helix is separated into two strands, the strands should reanneal, given the appropriate ionic conditions and time. (B) Similarly, if DNA is separated into its two strands, RNA should be able to bind to the genes that encode it. If present in sufficiently large amounts compared with the DNA, the RNA will replace one of the DNA strands in this region. When the total nuclear DNA from a human cell is cleaved with Eco R1, it generates so many fragments of different sizes that when the fragments are separated by agarose gel electrophoresis they appear as a smear of DNA rather than individual bands. It would be impossible to determine if a particular band was present or perhaps altered. The technique of Southern blotting permits the detection of a single fragment of DNA using a sequence–specific probe. Before understanding the actual blotting techniques, let's see the role of probes in hybridization. Probes are small (15 – 30 bases long) nucleotide sequences used to detect the presence of complementary sequences in nucleic acid samples. This is achieved by permitting the probes to base pair with the sample nucleic acids and then identifying the samples that show base pairing with the probes, that is hybridization. The detection of hybridization is highly precise and extremely sensitive provided the probes are suitably labeled for an easy detection. Clearly, hybridization can only occur when the base sequence of a probe is present within the gene or DNA segment which it is aimed to detect. RFLP in the beta globin gene in sickle cell anemia The wild–type beta–globin gene (red) and the sickle cell anemia beta–globin gene (pink) are shown. DNA fragments are separated by gel electrophoresis and the bands are transferred to a special membrane that binds single–stranded nucleic acid. Typically the DNA is first denatured in the gel, by soaking it in alkaline buffer, and then it is rapidly neutralized. The gel is laid flat, the membrane is laid over the gel, and a stack of absorbent paper towels is placed on top of the membrane. The absorbent paper will wick the liquid from the gel through the membrane and, as it does so, the DNA will travel from the gel onto the membrane and be bound there. The relative positions of the DNA in the gel are preserved when the DNA is transferred to the membrane. The membrane, also referred to as the blot, is removed and then mixed with a specific probe. The probe is a single strand of DNA of a specific sequence, typically labeled fluorescently or radioactively. The membrane is placed in a solution with the probe and left for several hours. The probe will anneal (hybridize) to the fragments bound to the membrane that contain complementary DNA sequences. The unbound probe is washed away, and what remains on the blot is the labeled probe hybridized to the fragments that possess complementary DNA. Using this technique, one can detect the presence of a unique fragment of DNA in an entire fragmented genome. In the adjacent figure shown the procedure of separating DNA molecules. In the figure, this is the part of the gene that is recognized by the probe. The Dde I sites are marked by the stars. The mutation in the beta–globin gene results in the loss of one Dde I site. Genomic DNA is isolated from the cells of normal (wild type) sickle cell carriers (heterozygous for the sickle cell beta–globin gene – one wild–type gene and one sickle cell beta–globin gene) and sickle cell patients (homozygous for the sickle cell beta–globin gene – both genes are sickle cell beta–globin). Remember that cells are diploid and thus have two copies of each gene. The genomic DNA is cleaved with Dde I, the fragments are separated by gel electrophoresis and then transferred to the membrane. The membrane is hybridized to labeled beta–globin DNA. 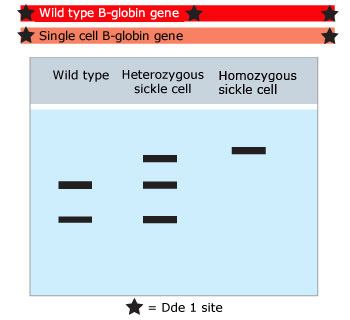 The wild–type gene has two fragments and the sickle cell gene has only one larger fragment. Southern blotting. 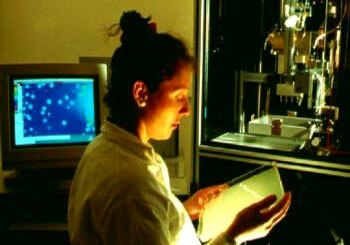 Female researcher examining a Southern blot film. Southern blotting and hybridization techniques have been employed to detect and screen for genetic diseases and disorders. For instance, the disease sickle cell anemia arises from a single nucleotide change in the beta–globin gene. This change in sequence affects the recognition site of the restriction endonuclease Dde I (a type of restriction enzyme), so that it can no longer cleave the DNA. This will change the Dde I cleavage pattern for the beta–globin gene. This is referred to as restriction fragment length polymorphism (RFLP). One can detect the particular RFLP associated with sickle cell anemia by preparing a Southern blot of DNA cut with Dde I and then hybridizing it to a probe specific for beta–globin. It is clear that southern blotting is a technique used to detect single stranded DNA. Now let's understand another related technique named Northern blotting. In this procedure, isolated mRNA is separated by gel electrophoresis and then transferred to membrane, where it is hybridized to a labeled, single–stranded DNA probe. This permits the detection of mRNAs that are complementary to a specific sequence of DNA and allows one to monitor the expression and differential splicing of a single gene in many different tissues. Western blotting is another technique where proteins are electrophoresed (separated) in polyacrylamide gel, transferred onto a nitrocellulose or nylon membrane (to which they bind strongly), and the protein bands are detected by their specific interaction with anitboidies, lectins or some other compounds. In the adjacent figure one of the blotting techniques that is southern blotting has been shown. This technique uses enzymes to fragment DNA (deoxyribonucleic acid), and the fragments are then separated in an electrophoresis gel. The separated fragments are then "blotted" onto a nitrocellulose filter and marked with radioactive probes. The probes indicate the presence of specific genes (lengths of DNA that code for proteins). A sheet of photographic film is then laid over the filter. The radioactivity darkens the film, which reveals the position of genes in the DNA. This technique is widely used in genetic research. Gene cloning. 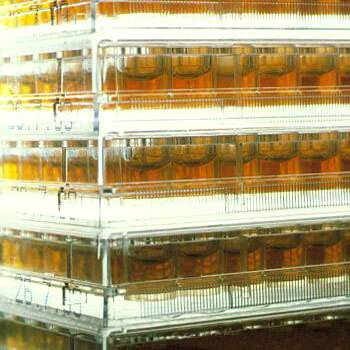 Pipetting solutions containing bacterial cultures from vessels in a multi–well sample tray into petri dishes. Although the techniques described allow one to distinguish a region of DNA from the genome at large, it is even more useful to be able to isolate just the gene of interest and produce sufficient quantities of that particular region of the genome for additional investigations and manipulations. DNA cloning is the process of extracting just one region of the genome and producing many identical molecules of this DNA sequence. In order to do so, a recombinant DNA molecule (the DNA sequence of interest joined to a vector sequence) is constructed. A vector is a DNA molecule that has the ability to replicate in an appropriate host cell, and into which the DNA fragment to be cloned (called DNA insert) is integrated for cloning. Therefore, a vector must have an origin of DNA replication (denoted as ori) that functions in the host cell. Any extra–chromosomal small genome, e.g., plasmid, phage and virus, may be used as a vector. In the adjacent figure shown the procedure involved in gene cloning. The bacteria are used for gene reproduction. Their growth rate is controlled by enzymes and salts in the solutions. Cloned or recombinant Deoxyribonucleic Acid is produced by fragmenting genes and attaching individual DNA fragments to the genes of rapidly reproducing DNA species such as bacteria. If a fragment of the DNA being studied is inserted into the genes of the bacteria, it will be reproduced when the bacterium cell divides. 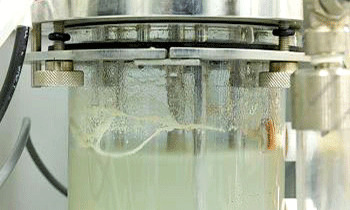 As the bacteria divide rapidly, many copies of the fragment will quickly be produced in this cloning procedure. 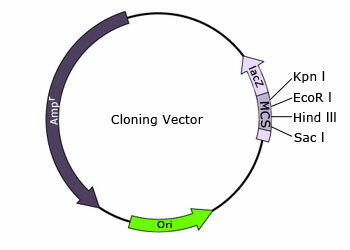 A typical plasmid used for cloning The origin of replication (ORI) is indicated in green. The antibiotic resistance gene (Amp) is indicated in dark blue, and a region composed of multiple cloning sites is indicated in pale purple. The vector sequence supports the replication and transmission of the recombinant DNA (usually in bacteria). 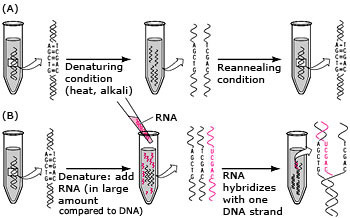 Recombinant DNA molecules are created by mixing DNA fragments (e.g. fragments generated by Eco R1) from different sources (e.g. human and bacteria) that have compatible ends and then adding the enzyme ligase, which will join the two fragments of DNA. (If we recall that DNA ligase joins the Okazaki fragments in DNA replication). 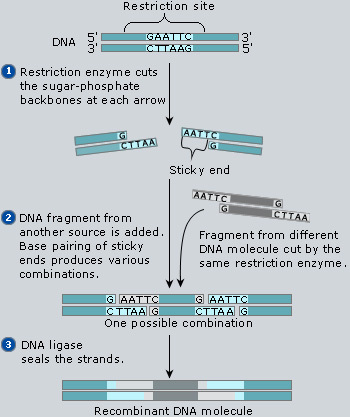 In the test tube, isolated ligase will also join DNA fragments in a reaction termed ligation, as long as the ends are compatible (the same sticky ends or two blunt ends). Once the recombinant molecule is made, it can be introduced into bacteria, where it will replicate and make many copies of this novel combination of DNA (our gene of interest). Most recombinant DNA molecules are made using bacterial plasmids as vectors. 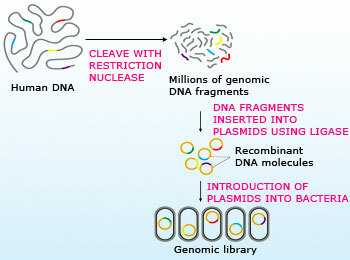 Plasmids are small (3,000 – 12,000 bp), circular DNA molecules that replicate in bacteria. All plasmids have an origin of replication (ORI), and many also encode for an antibiotic resistance (typically ampicillin resistance). Most plasmid vectors also have a number of different restriction endonucelase sites, so that foreign DNA can be easily recombined with the plasmid. A recombinant DNA molecule can be introduced into bacteria through the process of transformation. 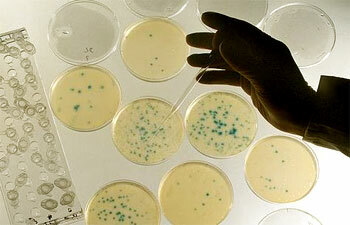 The bacteria can be manipulated to take up DNA from the media in which they reside. Each bacterium takes up only one recombinant molecule. Typically the product of a ligation will be used to transform the bacteria. The frequency of transformation is low, but the few bacteria that have taken up recombinant DNA can be selected for easily by placing the bacteria in media with antibiotics (e.g. ampicillin) – only those with the recombinant DNA molecule (including the plasmid vector) will grow. The recombinant plasmid is present in hundreds of copies per bacterium, and is stably replicated and segregated to daughter cells each time the bacterium divides. Starting from a single bacterium, one can produce a large culture of bacteria that carries the identical recombinant plasmid. 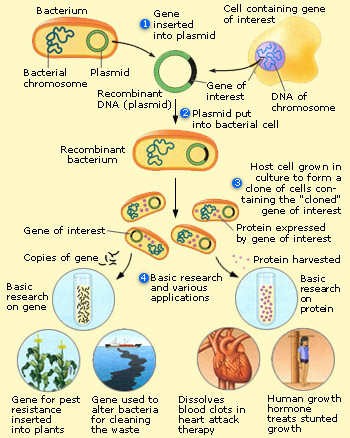 The bacterial culture can be lysed and the recombinant plasmid isolated from the rest of the bacterial DNA, providing a renewable source of pure recombinant plasmid. Using one or more somatic cells from a multicellular organism to make another genetically identical individual is called cloning, and is common in plants. Cloning has been tried in mammals, including mice, cats, cows, horses and pigs. Environmental influences and random phenomena can play a significant role during development. However, only a small percentage of cloned embryos develop normally to birth. And like Dolly, the first cloned lamb, many cloned animals exhibit various defects. Cloned mice, for instance, are prone to obesity, pneumonia, liver failure, and premature death. Scientists believe that even cloned animals that appear normal are likely to have subtle defects. In the nuclei of fully differentiated cells, a small subset of genes is turned on and expression of the rest is repressed. This regulation often is the result of epigenetic changes in chromatin, such as acetylation of histones or methylation of DNA. Many of these changes must be reversed in the nucleus from a donor animal in order for genes to be expressed or repressed appropriately for early stages of development. Researchers have found that the DNA in embryonic cells from cloned embryos, like that of differentiated cells, often has more methyl groups than does the DNA in equivalent cells from uncloned embryos of the same species. This finding suggests that the reprogramming of donor nuclei is not always complete. Because DNA methylation helps regulate gene expression, misplaced methyl groups in the DNA of donor nuclei may interfere with the pattern of gene expression necessary for normal embryonic development. The cloning of genes through this method has been supplemented by amplification of specific DNA sequences using the polymerase chain reaction. Due to the availability of the complete genomic sequence of many organisms, it is relatively easy to design PCR primers specific for the amplification of any portion of the genome. Gene cloning and PCR allow scientists to make a large amount of DNA from only a small fragment. Thus, DNA cloning is the method for amplifying the gene of interest in in vivo conditions, whereas the more advanced PCR technique happens in in vitro conditions, and where the amplification of DNA is rapid. How do these technologies work? Amplification of DNA through PCR PCR has basically successive rounds of denaturation, annealing of DNA primers and DNA synthesis. The Polymerase chain reaction (PCR) is a technique that rapidly amplifies specific DNA sequences. PCR is a very sensitive technique that requires small amounts of DNA (as little as 1 – 2 molecules of DNA), which are amplified and copied over a billion times. Because of its sensitivity, PCR has revolutionized many aspects of molecular biology and genetics, including diagnoses of diseases and forensic science. The description of adjacent figure shows the steps and mechanism of PCR amplification. The target DNA to be amplified is shown here in red, and a pair of complementary primers that flank the target DNA are shown in orange. DNA is denatured (at 95ºC), the solution is cooled (typically between 45 – 55ºC; shown here as 50ºC) to allow the primers to anneal to each strand, and then, heated to 72ºC (the optimal temperature for Taq DNA polymerase) for DNA synthesis. Typically 20 – 30 cycles are performed, producing many molecules of copied DNA that contain just the sequence between the pair of primers. DNA replication. 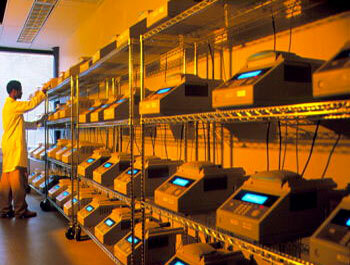 Technician with rows of thermocyclers used in research into the human genome at Celera Genomics, Maryland, USA. Thermocyclers clone DNA using a polymerase chain reaction (PCR). Celera aimed to sequence every gene in human DNA (deoxyribonucleic acid) by 2001. Human DNA is made up of some 30,000 genes among over 3 billion base pairs. 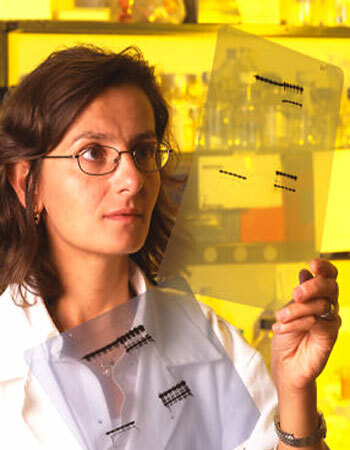 Celera sequences DNA fragments and uses supercomputers to put the pieces together. This is a cruder but faster method than that used by the publicly–funded Human Genome Project. The complete human genome map will allow improved drug design and a greater understanding of genetic diseases. PCR is only feasible because of the discovery and isolation of thermostable DNA polymerase. The first thermostable DNA polymerase was isolated from the bacterium Thermus aquaticus, which normally grows in the water of hot springs. This enzyme, called Taq DNA polymerase, is optimally active at 72°C and can retain its activity after successive heating to denature the template DNA. With each successive cycle of DNA synthesis, the number of copies of the target sequence is doubled. 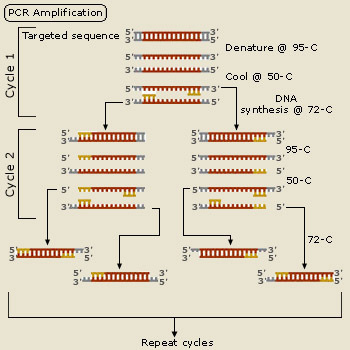 Typically 20–30 cycles of DNA synthesis will be performed, resulting in 106–109 copies of the target sequence. Step 1: At the start of PCR, the DNA from which a segment is to be amplified, an excess of the two primer molecules, the four deoxyriboside triphosphates and the DNA polymerase are mixed together in the reaction mixture. The following operations are now performed sequentially. Step 2: The mixture is now cooled to a temperature (generally 40–60 degree C) that permits annealing of the primer to the complementary sequences in the DNA; these sequences are located at the 3' ends of the two strands of the desired segment. This step is called annealing. Step 3: The temperature is now so adjusted that the DNA polymerase synthesizes the complementary strands by utilizing 3' – OH of the primers; this reaction is same as that occurs in vivo during replication of the leading strand of a DNA duplex. The primers are extended towards each other so that the DNA segment lying between the two primers is copied; this is ensured by employing primers complementary to the 3' ends of the segment to be amplified. In case of Taq polymerase, the optimum temperature for synthesis is between 70-75 degree C; the temperature of reaction mixture is, therefore, adjusted to this temperature. This situation has the following additional advantages. Between 70–75 degree C, the base pairing between about 20 bases long primers and the DNA is much more specific than at 37 degree C, the optimal temperature for E.coli DNA polymerase. This minimizes the chances of annealing of primers to imperfectly matched sequences and thereby, amplification of unwanted DNA. The specificity of annealing is further increased by selecting appropriate conditions like ionic strength, primer length etc. The completion of step 3 completes the first cycle of amplification; each cycle may take few (ordinarily 1–3) minutes. Step 4: The next cycle of amplification is initiated by denaturation (step 1), which separates the newly synthesized DNA strands from the old DNA strands. Step 5: Annealing allows the primers to base pair with both the new and old strands, the total number of strands being twice their original number. Step 6: Synthesis of new strands takes place, which doubles the number of copies of the desired DNA segment present at the end of step 1. This completes the second cycle. Cloning genetic fragments. 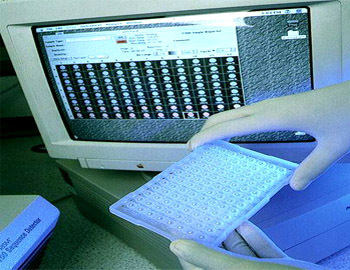 Technician's gloved hands hold an assay tray with fragments of genetic material in front of a monitor displaying results from PCR equipment. PCR produces identical copies (clones) of fragments of genetic material, such as RNA (ribonucleic acid) and DNA (deoxyribonucleic acid). The polymerase enzymes used make single strands of genetic material synthesize mirror copies of themselves. Repeating this process produces large numbers of duplicate fragments for analysis. PCR is useful when only a tiny amount of genetic material can be isolated. At each cycle, both new and old strands anneal to the primers and serve as templates for DNA synthesis. As a result, at the end of each cycle, the number of copies of the desired segment becomes twice the number present at the end of the previous cycle. Thus at the end of n cycles 2n copies of the segment are expected; the real values are quite close to its expectation. The cycle may be repeated upto 60 times, but usually 20 – 30 cycles are adequate. In case of automated PCR machines, called thermal cyclers, the researcher has to only specify the number and duration of cycles etc, after placing the complete reaction mixture for incubation, and the machine performs the entire operations precisely. After PCR cycles, the amplified DNA segment is purified by gel electrophoresis and can be used for the desired purpose. Steps involved in preparation of genomic library A genomic library is a collection of the total genomic DNA from a single organism. Advances in genome library construction and DNA sequencing has allowed for efficient discovery of different molecular targets. A genomic library is composed of DNA from a nuclear genome fragmented by restriction endonuclease digestion and recombined with vector DNA. Each recombinant plasmid (or clone) has the same vector sequence, but has a different region of the genome (sometimes referred to as the insert) with which it is recombined. A complete genomic library would contain every region of the genome represented as a clone. A cDNA (complementary DNA) library is composed of the "expressed" genome. It is made of DNA copies of the mRNA expressed in a particular cell. The mRNA is isolated from a specific tissue or cell type and is copied into DNA using the enzyme reverse transcriptase. Reverse transcriptase is normally encoded by double–stranded RNA viruses. It will copy RNA into DNA. The cDNA libraries are specific for the tissue from which the mRNA is isolated. The distribution of sequences in the cDNA library is also tissue specific. A gene that is highly expressed will be copied into DNA more often and therefore compose a larger fraction of the library than a gene that is poorly expressed. The cDNAs, since they are made from mature mRNAs, will only include the exons and not the introns. In fact, early comparisons of cDNAs and genomic sequences first alerted scientists to the existence of exons and introns. Shown are three "books" in a plasmid library. Each "book" is a clone of bacterial cells containing copies of a particular foreign genome fragment in its recombinant plasmid. These genome segments can also be stored in a phage library. Genome research Automated construction of a gene library, using a robot (background) to selectively clone specific genes. 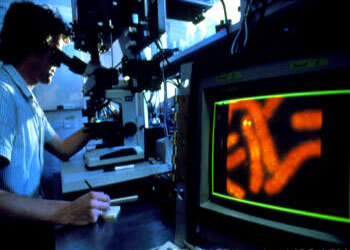 This scientist inspects a source plate of various gene colonies; the robot's view of part of the same appears on screen. Specific cultures are selected on the basis of their shape, size & color prior to being cloned through repeated cycles of inoculation into wells of growth media. 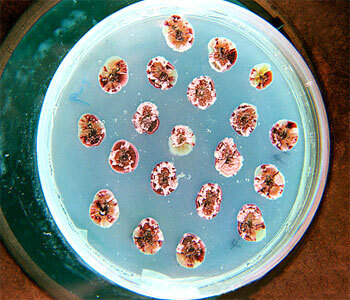 Up to 1000 colonies per hour may be handled in this way. This level of automation is needed in the hugely tedious task of sorting and deciphering the DNA of each human chromosome. The cDNA libraries and genomic libraries, once made, are used to transform bacteria, and each transformed bacterium (transformant) contains a different clone from the library. This collection of bacteria can be screened to isolate the individual colonies that carry the recombinant clone of interest. This can be achieved through a colony filter lift and hybridization. A colony filter lift is analogous to a Southern blot, however, instead of fragmented DNA being transferred to the membrane, recombinant plasmid DNA from different bacteria are transferred to the membrane. Bacteria are typically grown in petri dishes, and each colony is a growth of bacteria originating from a single bacterium. The colonies are transferred to membrane, lysed and the DNA is denatured. The membrane is then hybridized with a specific probe for the gene of interest. The region of the membrane that contains DNA from the colony bearing the desired clone is then labeled. This membrane is aligned with the original petri dish containing the colonies, and the correct one is selected. Individual recombinant clones, either a genomic clone or a cDNA clone, can be sequenced using the dideoxy chain termination method (described in the DNA replication). For any given library, the vector sequence is identical and is known; therefore, primers derived from the vector sequence can be used to determine the unknown DNA sequence inserted into the vector. The human genome project of the 1990s was carried out by generating thousands of random genomic clones, sequencing all of the inserts and assembling the sequence into overlapping stretches of contiguous genomic sequence. Research on the human genome Dr Peter Lichter, of Yale Medical School, using a light microscope to do fine mapping of long DNA fragments on human chromosomes using a technique known as non–radioactive in–situ hybridisation. The chromsomes appear in red on the monitor screen, whilst the DNA fragments (called probes) appear yellow/green. Mapping chromosomes may be regarded as a physical survey of each chromosome to find the location of genes or other markers. Mapping & sequencing are the two main phases of the genome project; an ambitious plan to build a complete blueprint of human genetic information. A genome map may be defined as a detailed schematic description of the structural and functional organization of all the chromosomes in the genome of an organism. The most ambitious mapping project to date has been sequencing of the human genome, officially begun as the Human Genome Project. Human Genome Project The Human Genome Project was organized to map and to sequence the human genome. In May 2007, the New York Times announced that the full genome of DNA pioneer James D. Watson had been recorded. The article noted that some scientists believe this to be the gateway to upcoming personalized genomic medicine. Many genomes have been sequenced by various genome projects. The estimated number of genes in the human genome has been repeatedly revised downward since the completion of the Human Genome Project; current estimates place the human genome at just under 3 billion base pairs and about 20,000 – 25,000 genes. A recent Science article gives a number of 20,488 protein – coding genes, with perhaps 100 more yet to be discovered. Genomics can also be considered a subfield of bioinformatics, which uses computational approaches to analyze large sets of biological data. Bioinformatics involves the manipulation, searching and data mining of DNA sequence data. String searching or matching algorithms, which find an occurrence of a sequence of letters inside a larger sequence of letters, were developed to search for specific sequences of nucleotides. The genome of an organism is its whole hereditary information and is encoded in the DNA (or for some viruses, RNA). This includes both the genes and the non–coding sequences of the DNA. The total complement of genes in an organism or cell is known as its genome. Genomic DNA is located in the cell nucleus of eukaryotes, as well as small amounts in mitochondria and chloroplasts. More precisely, the genome of an organism is a complete genetic sequence on one set of chromosomes; for example, one of the two sets that a diploid individual carries in every somatic cell. The term genome can also be applied to that stored within organelles that contain their own DNA, as with the mitochondrial genome or the chloroplast genome. Human genome project. A robot arm loads DNA into plastic plates in an automated laboratory dedicated to mapping the human genome. The arm is attached to an array of small metal tubes; each tube matches a tiny well in the plastic plates below. Once a plate is loaded the arm moves the metal tube array to the next plate. The human genome project is an international project to map genetic landmarks on the three billion bases that make up human DNA. The completed genome map will make it much easier to identify and study the genes involved in many diseases that are currently incurable. The study of the global properties of genomes of related organisms is usually referred to as genomics, which distinguishes it from genetics which generally studies the properties of single genes or groups of genes. The genetic information in a genome is held within genes and the complete set of this information in an organism is called its genotype. A gene is a unit of heredity and is a region of DNA that influences a particular characteristic in an organism. Genes contain an open reading frame that can be transcribed, as well as regulatory sequences such as promoters and enhancers, which control the transcription of the open reading frame. The number of base pairs and the number of genes vary widely from one species to another, and there is little connection between the two. At present, the highest known number of genes is around 60,000 for the protozoan causing trichomoniasis , almost three times as many as in the human genome. 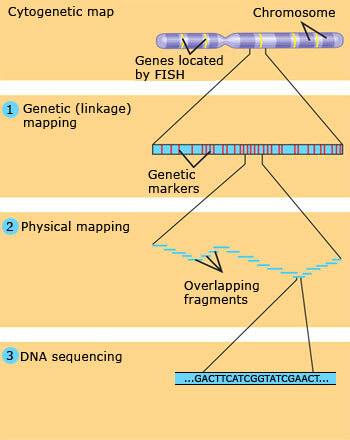 Three – stage approach to map an entire genome. Starting with a cytogenetic map of each chromosome, researchers with the Human Genome Project proceeded through three stages of mapping to reach the ultimate goal, the nearly complete nucleotide sequence of every chromosome. The book over one billion words long. The book is bound 5000 volumes, each 300 pages long. A copy of the book (all 5000 volumes) is contained in every cell (except red blood cells) as a strand of DNA over two meters in length. In many species, only a small fraction of the total sequence of the genome encodes protein. For example, only about 1.5% of the human genome consists of protein–coding exons, with over 50% of human DNA consisting of non–coding repetitive sequences. The reasons for the presence of so much non–coding DNA in eukaryotic genomes and the extraordinary differences in genome size, or C–value, among species represent a long–standing puzzle known as the "C–value enigma". DNA sequences that do not code protein may still encode functional non–coding RNA molecules, which are involved in the regulation of gene expression. Some non–coding DNA sequences play structural roles in chromosomes. Telomeres and centromeres typically contain few genes, but are important for the function and stability of chromosomes. An abundant form of non–coding DNA in humans are pseudogenes, which are copies of genes that have been disabled by mutation. These sequences are usually just molecular fossils, although they can occasionally serve as raw genetic material for the creation of new genes through the process of gene duplication and divergence. In addition to mapping human DNA, researchers with the Human Genome Project are also working on the genomes of other species important in biological research. They have completed sequences for E. coli and numerous other prokaryotes, Saccharomyces cerevisiae (yeast), Caenorhabditis elegans (nematode), Drosophilia melanogaster (fruit fly), Mus musculus (mouse), and quite a few others. Vessels with YAC Vessels containing yeast cultures incorporating human DNA fragments for the human genome project. The human DNA is present in yeast artificial chromosomes (YACs) in the yeast cells. It is cloned as the yeast reproduces, allowing analysis of the DNA. The human genome project aims to find the base sequence of all human genes, allowing for improved drug design and a greater understanding of genetic diseases. At present, we have different types of maps. Even before the Human Genome Project began, earlier research had painted a rough picture of the organization of the genomes of many organisms. For instance, the karyotype of a species reveals the number of chromosomes and their overall banding pattern. And some genes had already been located on a particular region of a whole chromosome by fluorescence in situ hybridization (FISH), a method in which fluorescence labeled probes are allowed to hybridize to an immobilized array of whole chromosomes. Cytogenetic maps based on this type of information provided the starting point for more detailed mapping. A genetic map is prepared on the basis of recombination data between carefully selected genetic markers usually ordered into suitable crosses. But in case of humans, linkage maps have to be prepared using family pedigree data. Physical mapping is process of arranging the DNA fragments in an order. In a physical map, the distances between markers are expressed in some physical measure, usually the number of base pairs along the DNA. For whole–genome mapping, a physical map is made by cutting the DNA of each chromosome into a number of restriction fragments and then determining the original order of the fragments in the chromosomal DNA. In this way, more and more fragments can be assigned to a sequential order that corresponds to their order in a chromosome. Supplies of the DNA fragments used for physical mapping are prepared by cloning. In working with large genomes, researchers carry out several rounds of DNA cutting, cloning, and physical mapping. The first cloning vector is often a yeast artificial chromosome (YAC), which can carry inserted fragments a million base pairs long or a bacterial artificial chromosome (BAC), an artificial version of a bacterial chromosome that can carry inserts of 100,000 to 500,000 base pairs. After such long fragments are ordered, each fragment is cut into smaller pieces, which are cloned in plasmids or phages, ordered in turn, and finally sequenced. Bands on X-ray representing DNA sequencing Scientist points to bands representing nucleotide bases (A,C,T,G) in an x–ray image of a gel. Sanger method. The ultimate goal in mapping a genome is to determine the complete nucleotide sequence of each chromosome. If a pure preparation of many copies of a DNA fragment up to about 800 base pairs in length is available, the sequence of the fragment can be determined by a sequencing machine. The study of DNA replication, in particular the isolation and investigation of DNA polymerase, has lead to the development of two technological advances in molecular biology: the chain termination method of DNA sequencing and the polymerase chain reaction (PCR). The chain termination method (or dideoxy method) of DNA sequencing was first described by Fred Sanger in 1977, and in 1980 he was awarded the Nobel Prize for this work. This method of sequencing is based on a DNA synthesis reaction carried out in a test tube, using the DNA that is to be sequenced as a template. In addition to the normal deoxyribonucleotides (dATP, dCTP, dGTP and dTTP), DNA synthesis occurs in the presence of dideoxyribonucleotides(ddATP, ddCTP, ddGTP and ddTTP); they are capable of being added to newly synthesized DNA, but terminate any further extension of the strand because they lack the 3' hydroxyl necessary to form a phosphodiester bond with the next incoming nucleotide. Therefore, reactions are set up with denatured DNA template (the DNA fragment to be sequenced), a synthetic single–stranded DNA primer (analogous to the RNA primer during DNA replication), deoxyribonculeotides and DNA polymerase. The dideoxy method of DNA sequencing. The photograph contains a region of the autoradiograph containing this sequence. In addition to the above, each reaction contains a small amount of one of the four dideoxynucleotides. 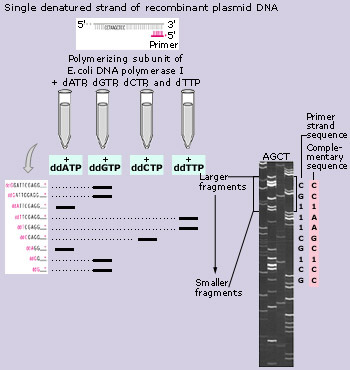 DNA polymerase uses the primer and makes a partial copy of the template. However, as soon as a dideoxyribonucleotide is incorporated into the newly synthesized strand, the new strand is terminated and DNA polymerase cannot add any additional nucleotides. Therefore, in the reaction containing ddATP, there will be many newly synthesized fragments of DNA of different sizes that are complementary to the template, and all of which end with the nucleotide adenine (A). In the reaction run in the presence of ddCTP, all fragments will terminate with cytosine (C), and ddGTP and ddTTP will terminate with guanine (G) and thymine (T), respectively. The products of each reaction are next separated by gel electrophoresis, which separates DNA fragments based on their lengths. One can determine the sequence by its position and by the terminating nucleotide of each fragment. For example, if one observes a fragment of 10 nucleotides ending with the nucleotide A, a fragment of 11 nucleotides ending with the nucleotide T, and a fragment of 12 nucleotides ending with the nucleotide C, then the sequence is ATC. By reading up the gel (from bottom to top), one can read the sequence of the DNA (5' to 3') that was copied in the reaction. This method has been greatly enhanced in recent years through the use of automated sequencing machines and fluorescently labeled dideoxyribonucleotides. These advances, and others, greatly facilitated the large–scale effort to sequence the entire human genome (the bulk of which was completed by the end of the year 2000). 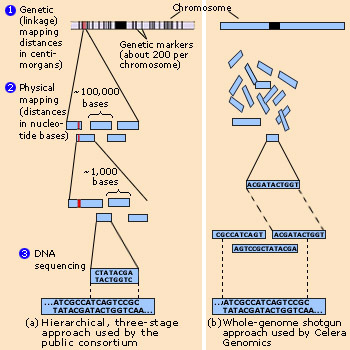 Whole–genome shotgun approach to sequencing. In this approach, developed by Celera Genomics, random DNA fragments are sequenced and then ordered relative to each other. Compare this approach with the hierarchical, three–stage approach shown in the figure. 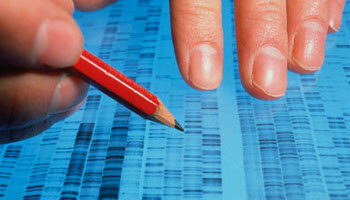 It is also known as full genome sequencing, complete genome sequencing, or entire genome sequencing. It is a laboratory process that determines the complete DNA sequence of an organism's genome at a single time. This entails sequencing all of an organism's chromosomal DNA as well as DNA contained in the mitochondria and, for plants, in the chloroplast. Almost any biological sample—even a very small amount of DNA or ancient DNA—can provide the genetic material necessary for full genome sequencing. Such samples may include saliva, epithelial cells, bone marrow, hair (as long as the hair contains a hair follicle), seeds, plant leaves, or anything else that has DNA–containing cells. Because the sequence data that is produced can be quite large (for example, there are approximately six billion base pairs in each human diploid genome), genomic data is stored electronically and requires a large amount of computing power and storage capacity. Full genome sequencing would have been nearly impossible before the advent of the microprocessor, computers. The three stages of mapping (genetic mapping, physical mapping and DNA sequencing) explained above overlap in a way that our simplified version does not portray, but they accurately represent the overarching strategy employed in the Human genome project. In 1992, emboldened by advances in sequencing and computer technology, molecular biologist J. Craig Venter devised an alternative approach to the sequencing of whole genomes. His idea was essentially to skip the genetic mapping and physical mapping stages and start directly with the sequencing of random DNA fragments. Powerful computer programs would then assemble the resulting very large number of overlapping short sequences into a single continuous sequence. 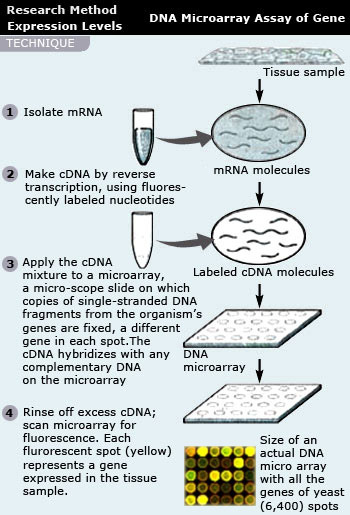 Shows the steps involved in DNA microarray procedure. A DNA microarray/ gene chip/ biochip is a collection of microscopic DNA spots attached to a solid surface. Scientists use DNA microarrays to measure the expression levels of large numbers of genes simultaneously or to genotype multiple regions of a genome. Now that the sequences of entire genomes are available, scientists can study whole sets of genes and their interactions, an approach called genomics. Genomics is yielding new insights into fundamental questions about genome organization, regulation of gene expression, growth and development, and evolution. Using the methods of DNA technology, geneticists can study genes directly, without having to infer genotype from phenotype, as in classical genetics. Knowing the sequence does not tell us the function of the genes. One way to determine their function is to disable the gene and hope that the consequences provide clues to the gene's normal function. In one application of this approach, called in vitro mutagenesis, specific mutations are introduced into the sequence of a cloned gene, after which the mutated gene is returned to a cell. If the introduced mutations alter or destroy the function of the gene product, the phenotype of the mutant cell may help reveal the function of the missing normal protein. Researchers can even put such a mutated gene into cells from the early embryo of a multicellular organism (such as mouse) to study the role of the gene in the development and functioning of the whole organism. A simpler and faster method for silencing expression of selected genes exploits the phenomenon of RNA interference (RNAi). This experimental approach uses synthetic double–stranded RNA molecules matching the sequence of a particular gene to trigger breakdown or to block translation of the gene's messenger RNA. A major role of genomics is to learn how genes act together to produce and maintain a functioning organism. The main approach for genome–wide expression studies uses DNA microarray assays. A DNA microarray consists of tiny amounts of a large number of single–stranded DNA fragments representing different genes fixed to a glass slide in a tightly spaced array (grid). With this method, researchers can test thousands of genes simultaneously to determine which ones are expressed in a particular tissue, under different environmental conditions in various disease states, or at different developmental stages. They can also look for coordinated gene expression. Proteomics, the systematic study of full protein sets Example: Antibody response, conceptual image. 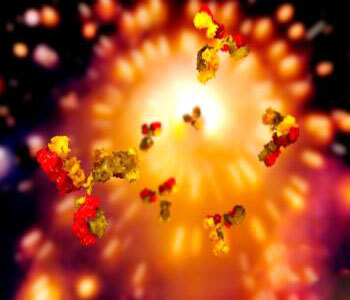 Computer artwork representing immunoglobulin (Ig) molecules (red and yellow) responding to a pathogen. Each Y–shaped molecule has two arms (top) that can bind to specific antigens, for instance bacterial or viral proteins. In doing this they mark the antigen for destruction by phagocytes, white blood cells that ingest and destroy foreign bodies. Antibodies can also kill some pathogens directly, and can neutralize toxins. Genomics and proteomics are enabling biologists to now be in a position to complete catalogs of genes and proteins – a listing of all the "parts" that contribute to the operation of cells, tissues, and organisms. The next step after mapping and sequencing genomes is Proteomics, the systematic study of full protein sets (proteomes) encoded by genomes. One challenge is the sheer number of proteins in humans and the proteins are extremely varied in structure, chemical and physical properties. Because proteins are the molecules that actually carry out cell activities, we must study them to learn how cells and organisms function. Genomics and proteomics are enabling biologists to approach the study of life from an increasingly global perspective. Biologists are now in a position to complete catalogs of genes and proteins – a listing of all the "parts" that contribute to the operation of cells, tissues, and organisms. Bioinformatics as a discipline arose out of the need to introduce order into the massive data sets produced by the new technologies of molecular biology: large–scale DNA sequencing, measurements of RNA concentrations in multiple gene expression arrays, and new profiling techniques in proteomics. As such, bioinformatics integrates a number of traditional quantitative sciences such as mathematics, statistics, computer science and cybernetics with biological sciences such as genetics, genomics, proteomics and molecular evolution. Another exciting prospect is our increasing understanding of the spectrum of genetic variation in humans. In other words, if you could compare your personal DNA sequence with that of a person of the same gender, either sitting next to you or on the other side of the world, you would find them to be 99.9% identical. Most of our diversity seems to be in the form of single nucleotide polymorphisms (SNPs, pronounced as "snips"), which are single base–pair variations in the genome, usually detected by sequencing. In human genome, SNPs occur on average about once in 1,000 base pairs. This will be useful as genetic markers for studying human evolution, the differences between human populations, and the migratory routes of human populations throughout history. SNPs and other polymorphisms in non-coding and coding DNA will also be valuable markers for identifying disease genes and genes that affect our health in more subtle ways. "Dolly", the sheep clone Eight month old "Dolly", the world's first sheep cloned from an adult sheep cell. The use of recombinant DNA technology has become common place as new products from genetically altered plants, animals, and microbes have become available for human use. In 1997, Dolly made headlines as the first successfully cloned large mammal (sheep). Dolly is the result of research conducted by Dr. Ian Wilmut at the Roslin Institute in Edinburgh, Scotland. Wilmut's work involved taking an egg cell from a Scottish Blackface (SB) ewe and removing the cell nucleus. Next, an adult cell from the udder of a 6 year old Finn Dorset ewe was cultured and then injected into the enucleated egg cell. A spark of electricity then fused the udder cell with the egg cytoplasm and stimulated the egg to grow into an embryo in the womb of a surrogate SB sheep. 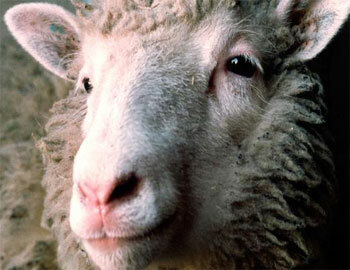 In 1997, Wilmut introduced to the world "Dolly", the first such sheep clone. Since then there have been many similar advances in medicine, such as treatments for cancer; many advances in agriculture, such as transgenic insect–resistant crops; and many advances in animal husbandry, such as growth hormones and transgenic animals (an animal that has received recombinant DNA). Most biotechnologists envision DNA technological applications as one of the new frontiers in science with tremendous growth and discovery potential. Insulin production. 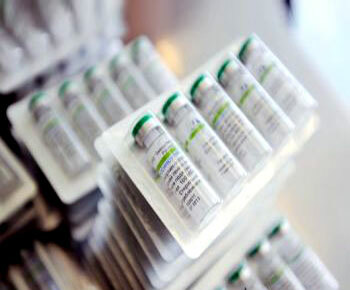 Insulin is a well-characterized peptide that can be produced by recombinant DNA technology for human therapeutic use. Millions of people depend on insulin treatment to control their disease. Some 2 million people with diabetes in the United States alone depend on insulin treatment to control their disease. Human growth hormone has been a boon to children born with a form of dwarfism caused by inadequate amounts of HGH. An other important pharmaceutical product produced by genetic engineering is tissue plasminogen activator (TPA). If administered shortly after a heart attack, this protein helps dissolve blood clots and reduces the risk of subsequent heart attacks. DNA technology also can be used to produce vaccines, which stimulate the immune system to defend against specific pathogens. Traditional vaccines are of two types: inactivated (killed) microbes and viable but weakened (attenuated) microbes that generally do not cause illness. Most pathogens have one or more specific proteins on their surface that trigger an immune response against it. This type of protein, produced by recombinant DNA techniques, can be used as a vaccine against the pathogen. Alternatively, genetic engineering methods can be used to modify the genome of the pathogen to attenuate it. Insulin is used to treat insulin–dependent diabetes mellitus, a medical condition where the body does not produce enough insulin hormone itself. Manufacture of insulin is strictly controlled to ensure the purity of the finished product. 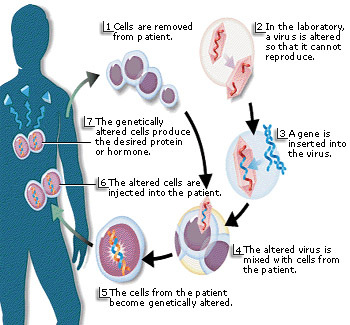 The steps involved in gene therapy procedure. Gene therapy treats disease by "repairing" dysfunctional genes or by providing copies of missing genes..
Gene therapy is a novel approach to treat, cure, or ultimately prevent disease by changing the expression of a person's genes. Gene therapy is in its infancy, and current therapies are primarily experimental, with most human clinical trials still in the research stages. Genes are composed of DNA that carries information needed to make proteins – the building blocks of our bodies. Variations in the DNA sequence or code of a gene are called mutations, which often are harmless but sometimes can lead to serious disease. Gene therapy treats disease by "repairing" dysfunctional genes or by providing copies of missing genes. Gene therapy is the use of DNA as a pharmaceutical agent to treat disease. It derives its name from the idea that DNA can be used to supplement or alter genes within an individual's cells as a therapy to treat disease. The most common form of gene therapy involves using DNA that encodes a functional, therapeutic gene in order to replace a mutated gene. Other forms involve directly correcting a mutation, or using DNA that encodes a therapeutic protein drug (rather than a natural human gene) to provide treatment. In gene therapy, DNA that encodes a therapeutic protein is packaged within a "vector", which is used to get the DNA inside cells within the body. Once inside, the DNA becomes expressed by the cell machinery, resulting in the production of therapeutic protein, which in turn treats the patient's disease. Thus, Gene therapy is revolutionizing the world of medicine. Many physicians are predicting that in twenty years gene therapy may change the practice of medicine from a treatment-based to a prevention-based practice. Our future is locked away inside of our genes. Gene therapy is unlocking these doors. Researchers are starting to move away from developing new drugs, and towards finding an ultimate solution. 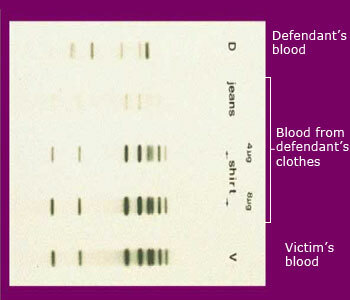 DNA fingerprints from a murder case This autoradiograph shows that DNA in blood from the defendant's clothes matches the DNA fingerprint of the victim but differs from the DNA fingerprint of the defendant. This is evidence that the blood on the defendant's clothes came from the victim, not the defendant. The three DNA samples were subjected to Southern blotting using radioactive probes. 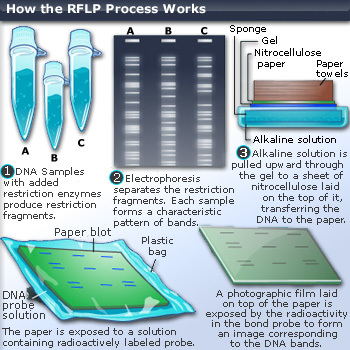 The DNA bands resulting from electrophoresis were exposed to probes for several different RFLP markers in succession, with the previous probe washed off before the next one was applied. DNA is present in nearly every cell of our body, and we leave cells behind everywhere we go without even realizing it. Flakes of skin, drops of blood, hair, and saliva all contain DNA that can be used to identify us. In fact, the study of forensics, commonly used by police departments and prosecutors around the world, frequently relies upon these small bits of shed DNA to link criminals to the crimes they commit. This fascinating science is often portrayed on popular television shows as a simple, exact, and infallible method of finding a perpetrator and bringing him or her to justice. In truth, however, teasing out a DNA fingerprint and determining the likelihood of a match between a suspect and a crime scene is a complicated process that relies upon probability to a greater extent than most people realize. Government–administered DNA databases, such as the Combined DNA Index System (CODIS), do help speed the process, but they also bring to light complex ethical issues involving the rights of victims and suspects alike. Thus, understanding the ways in which DNA evidence is obtained and analyzed, what this evidence can tell investigators, and how this evidence is used within the legal system is critical to appreciating the true ethical and legal impact of forensic genetics. To perform DNA fingerprinting, DNA is obtained from an individual's blood cells, hair fibers, skin fragments, or other tissue. The DNA is then extracted from the cells and digested with enzymes. The resulting fragments are separated by a process called electrophoresis. Electrophoresis is a process in which electrical charges separate DNA fragments according to size. The separated DNA fragments are then detected with DNA probes and used to develop a fingerprint. A statistical evaluation enables the forensic pathologist to compare a suspect's DNA with the DNA recovered at a crime scene and to state with a high degree of certainty (usually 99 percent) that the suspect was at the crime scene. Biofuel bacteria. Petri dish containing colonies of recombinant (genetically modified) Streptomyces bacteria (red) that may produce cellulase. This is the enzyme that breaks down cellulose (the primary structural material in plants). Bacteria that can produce cellulase, or similar enzymes, are able to ferment plant cellulose to produce ethanol for use as a fuel. Increasingly, the remarkable ability of certain microorganisms to transform chemicals has been exploited for environmental cleanup. Scientists are now engineering these metabolic capabilities into other microorganisms, which are then used to help treat some environmental problems. For example, many bacteria can extract heavy metals, such as copper, lead, and nickel, from their environments and incorporate the metals into compounds such as copper sulfate or lead sulfate, which are readily recoverable. Genetically engineered microbes may become important in both mining minerals and cleaning up highly toxic mining wastes. Biotechnologists are also trying to engineer microbes that can degrade chlorinated hydrocarbons and other harmful compounds. These microbes could be used in waste water treatment plants or by manufacturers before the compounds are ever released into the environment. The adjacent figure shows the petri dish with the bacteria that can produce cellulase, or similar enzymes, are able to ferment plant cellulose to produce ethanol for use as a fuel. Ethanol is added to petrol to improve vehicle performance and reduce air pollution. Fuels produced by biological means (biofuels) are renewable, unlike fossil fuels. The technology has been developed by the National Renewable Energy Laboratory, Golden, Colorado, USA. 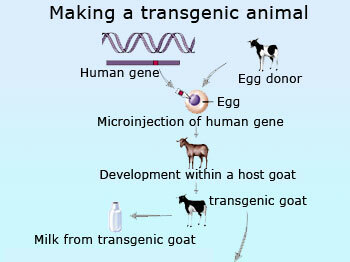 Production of transgenic animals. A transgenic animal is one that carries a foreign gene that has been deliberately inserted into its genome. The foreign gene is constructed using recombinant DNA methodology and the ultimate goal is to produce animals with incredible features. Healthy egg cells are removed from a female of the host animal and fertilized in the laboratory. The desired gene from another species is identified, isolated, and cloned. The cloned genes are injected directly into the eggs, which are then surgically implanted in the host female, where the embryo undergoes a normal development process. A differentiated cell, one that has become specialized during development, with its diploid nucleus is removed from an animal to provide the DNA source for the clone. An egg cell from a similar animal is recovered and the nucleus is removed, leaving only the cytoplasm and cytoplasm organelles. The two egg cells are fused with an electric current to form a single diploid cell, which then begins normal cell division. The developing embryo is placed in a surrogate mother, who then undergoes a normal pregnancy. 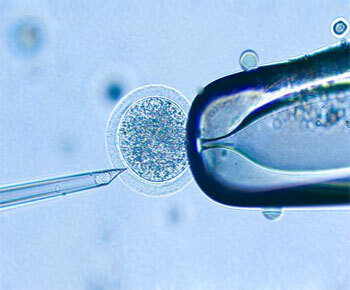 Cloning cows, nuclear transfer Light micrograph of an egg (female reproductive cell) from a cow (Bos taurus) being manipulated by a micropipette (right) and needle (left) during the nuclear transfer stage of the cloning process. At this stage the genetic material from another cell is transferred into an egg cell which has had its genetic material removed. Pharming: It's not just another misspelled word! The term "pharming" comes from a combination of the words "farming" and "pharmaceuticals." It's a melding of the most basic methods of agriculture with the most advanced biotechnology. The adjacent figure shows an example of this phenomenon and this particular work has been carried out at the Bio Sidus biotechnology company, in Argentina, which successfully cloned a cow in 2002. The cloned cows are intended to be used to produce human growth hormone (hGH) in their milk. Gene pharming is a technology that scientists use to alter an animal's own DNA, or to splice in new DNA, called a transgene, from another species. In pharming, these genetically modified (transgenic) animals are mostly used to make human proteins that have medicinal value. The protein encoded by the transgene is secreted into the animal's milk, eggs or blood, and then collected and purified. Livestock such as cattle, sheep, goats, chickens, rabbits and pigs have already been modified in this way to produce several useful proteins and drugs. These proteins must be tested very carefully to ensure that they will not cause allergic reactions or other adverse effects in patients receiving them. Researchers have already endowed a number of crop plants with genes for desirable traits, such as delayed ripening and resistance to spoilage and disease. This is because for plant species, a single tissue cell grown in culture can give rise to an adult plant. Thus, genetic manipulations can be performed on a single cell and the cell then used to generate an organism with new traits. The most commonly used vector for introducing new genes into plant cells is a plasmid, called the Ti plasmid, from the soil bacterium Agrobacterium tumefaciens. This plasmid integrates a segment of its DNA, known as T DNA, into the chromosomal DNA of its host plant cells. For vector purposes, researchers work with a version of plasmid that does not cause disease, as the wild–type version does. Scientists can introduce recombinant Ti plasmids into plant cells by electroporation. Alternatively, the recombinant plasmid can be put back into Agrobacterium; susceptible plants or plant cells growing in culture are then infected with bacteria that contain the recombinant plasmid. In nature, the Ti (tumor–inducing) plasmid in A.tumefaciens gains entry into a plant and is integrated into the plant DNA owing to the action of the VIR (virulent) region of the plasmid. Tumor–like growths (galls) result from action of the T region of the gene. By recombinant DNA techniques, a foreign gene (orange) is introduced within the T region of a Ti plasmid, thus destroying its tumor–inducing ability. 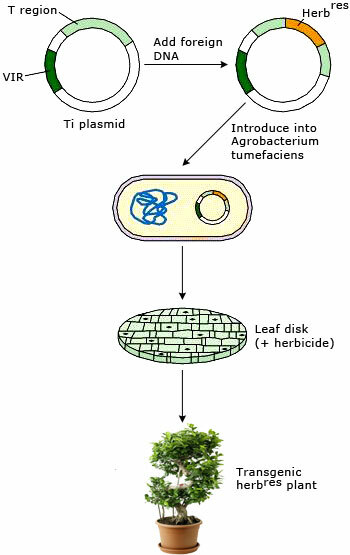 An agrobacterium containing such a recombinant Ti plasmid then is used to introduce the foreign gene into plant cells. When a selectable transgene is used – here one conferring resistance to herbicide – recombinant plants can be selected. Genetic engineering also has great potential for improving the nutritional value of crop plants. For example, scientists have developed transgenic rice plants that produce yellow rice grains containing beta–carotene, which our body uses to make vitamin A. Golden Rice is a potential new way to reduce vitamin A deficiency. Like transgenic animals, pharmaceutical industry is beginning to develop "pharm" plants. Although natural plants have long been sources of drugs, researchers are now creating plants that make human proteins for medical use and viral proteins for use as vaccines. Several such products are being tested in clinical trials, including vaccines for hepatitis B and an antibody produced in transgenic tobacco plants that interferes with the bacteria that cause tooth decay. Recombinat vaccines Cervarix cervical cancer vaccine. Cervarix prevents infection from certain strains of the human papillomavirus (HPV), which are associated with the development of cervical cancer. It is designed to prevent against virus strains 16 and 18 and also offers some protection against virus strains 45 and 31. It contains the adjuvant AS04, which boots the response of the immune system to the vaccine. Cervarix is manufactured by GlaxoSmithKline. Many industries stand to benefit from additional GMO research. For instance, a number of microorganisms are being considered as future clean fuel producers and biodegraders. In addition, genetically modified plants may someday be used to produce recombinant vaccines. In fact, the concept of an oral vaccine expressed in plants (fruits and vegetables) for direct consumption by individuals is being examined as a possible solution to the spread of disease in underdeveloped countries, one that would greatly reduce the costs associated with conducting large–scale vaccination campaigns. Work is currently underway to develop plant–derived vaccine candidates in potatoes and lettuce for hepatitis B virus (HBV), enterotoxigenic Escherichia coli (ETEC), and Norwalk virus. Scientists are also looking into the production of other commercially valuable proteins in plants, such as spider silk protein and polymers that are used in surgery or tissue replacement. Genetically modified animals have even been used to grow transplant tissues and human transplant organs, a concept called xenotransplantation. The rich variety of uses for GMOs provides a number of valuable benefits to humans, but many people also worry about potential risks. Recombinant vaccines can produce an immune response in the recipient organism without the complications associated with traditional vaccine methodology. Recombinant or purified protein vaccines consist of protein antigens that have either been produced in a heterologous expression system (e.g., bacteria or yeast) or purified from large amounts of the pathogenic organism. The vaccinated person produces antibodies to the protein antigen, thus protecting him/her from disease. A laboratory chemostat containing a culture of Escherichia coli, genetically modified to produce the bioplastic, polyhydroxybutyrate (PHB) PHB is a non-toxic biodegradable plastic suitable for use as food packaging, plastic cutlery and drinking vessels. E. coli is a fast growing bacterium suited to bulk liquid culture. It does not naturally make PHB. Genetic modification is used to control the amount and type of PHB produced by E. coli in culture. The picture shows a research-scale chemostat containing E. coli into which genes for PHB synthesis inserted. At and above the liquid culture surface, the plastic can be seen adhering to the inside of the chemostat (off-white strands, center and to left). PHB is expensive compared to oil–based plastics. Current research concerns the possible use of waste water as a feedstock in order to increase the competitiveness of the product. Despite the fact that the genes being transferred occur naturally in other species, there are unknown consequences to altering the natural state of an organism through foreign gene expression. After all, such alterations can change the organism's metabolism, growth rate, and/or response to external environmental factors. These consequences influence not only the GMO itself, but also the natural environment in which that organism is allowed to proliferate. Potential health risks to humans include the possibility of exposure to new allergens in genetically modified foods, as well as the transfer of antibiotic–resistant genes to gut flora. Horizontal gene transfer of pesticide, herbicide, or antibiotic resistance to other organisms would not only put humans at risk, but it would also cause ecological imbalances, allowing previously innocuous plants to grow uncontrolled, thus promoting the spread of disease among both plants and animals. GMOs benefit mankind when used for purposes such as increasing the availability and quality of food and medical care, and contributing to a cleaner environment. If used wisely, they could result in an improved economy without doing more harm than good, and they could also make the most of their potential to alleviate hunger and disease worldwide. However, the full potential of GMOs cannot be realized without due diligence and thorough attention to the risks associated with each new GMO on a case–by–case basis. Finally, ethical considerations, as well as concern about potential environmental and health hazards, will likely slow some applications of biotechnology. There is always danger that too much regulation will stifle basic research and its potential benefits. However, the power of DNA technology and genetic engineering – our ability to profoundly and rapidly alter species that have been evolving for millennia – demands that we proceed with humility and caution.